A guitar rock band consisting of Chieko Matsuki (Vo, G), Shinjiro Okada (G), Hishashi Suzuki (B), and Rui Aranai (Dr). In 2003, Matsuki and Okada met and formed the prototype of the band. In July 2009, debut with the Tower Records limited single “Ningen Shinkaron” and the HMV limited single “Kyoto”. In November and December of 2010, released 2 singles “Sonzai Shoumei” and “Shuen Magiwa no Symposium”. Their sensible atmosphere and dynamic sounds caught many people’s attentions. In March 2011, released their 3rd album “Uchu no Minashigo”. The title of the album was taken from the novel written by Eto Mori, which had the same name. In May 2011, Aranai joined the band replacing the drummer at the time. In November, released their 1st 3-track single “Aoi Tsuki”. In December, announced their transfer to Universal J at their solo concert. In May 2012, released their 1st major album “Shinkirou”. 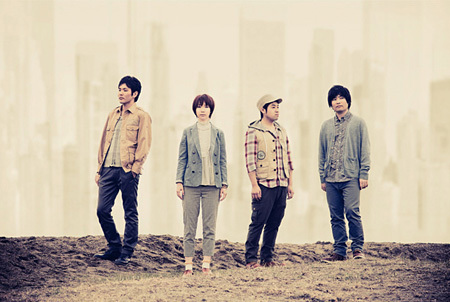 In November of the same year, released their 2nd major album “Maboroshi Anthology”.